Cobham is situated 17 miles from central London on the London to Portsmouth road and 3 miles from Esher in the Elmbridge borough of Surrey. Early development took place in the eighteenth century at Street Cobham on the Portsmouth Road, with the construction of inns for the coaches passing through. In Victorian times commercial activity was centered on Church Street. With the building of the railway line from London to Guildford, including Cobham station, in the 1880s, and the decline in the use of the horse due to the development of motor transport in the early 1900s, Cobham expanded. Since the Second World War, Cobham has seen the development of the A3 at Painshill and the M25 skirting Downside to the south. Superstores at Street Cobham and in the village centre have replaced the locally owned family stores. The post office has moved and the old Village Hall in Anyards Road has been replaced with a new building nearby. Shops have been built at Oakdene Parade, north of the High Street. 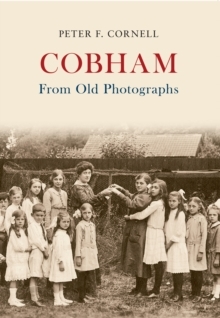 Cobham From Old Photographs gives glimpses of the changing pace of life in the village using images from the private collections of six Cobham business families, many of which have never been published before.